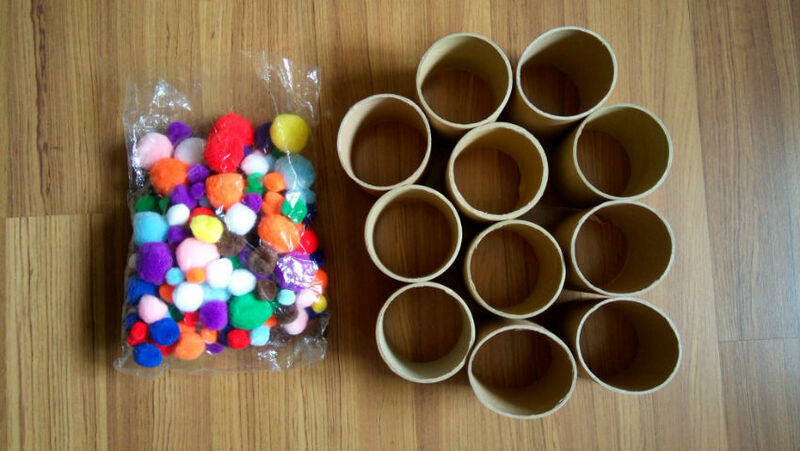 In my previous post I gave an introduction to loose parts play, gave examples of "loose parts" and described how this type of play is beneficial to children. In this post I will attempt to describe how loose parts play can be incorporated in the home, giving examples from my own homeschool. 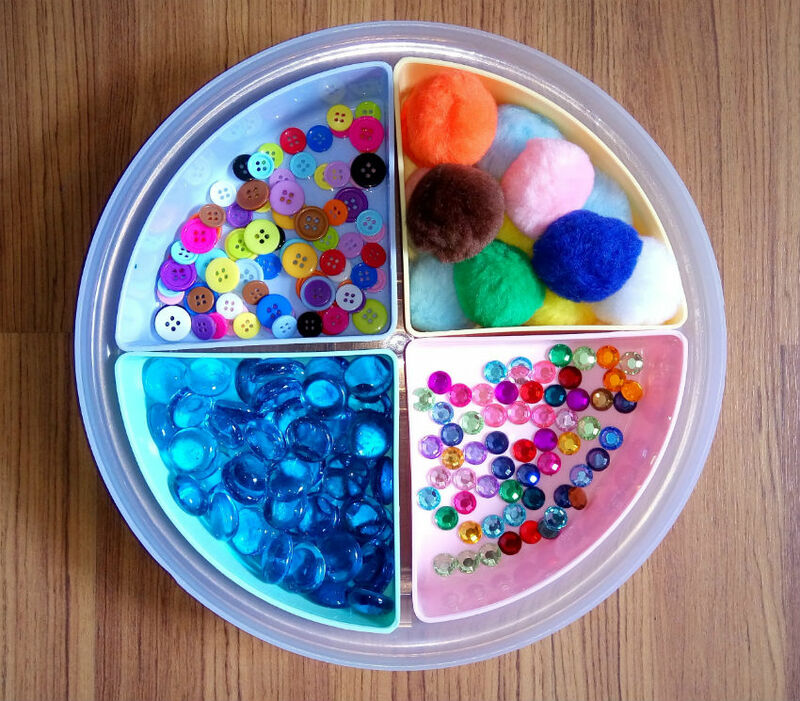 Although there are no specific directions on how loose parts are to be used when we present them to children, parents do play an active role in deciding what materials to give them. 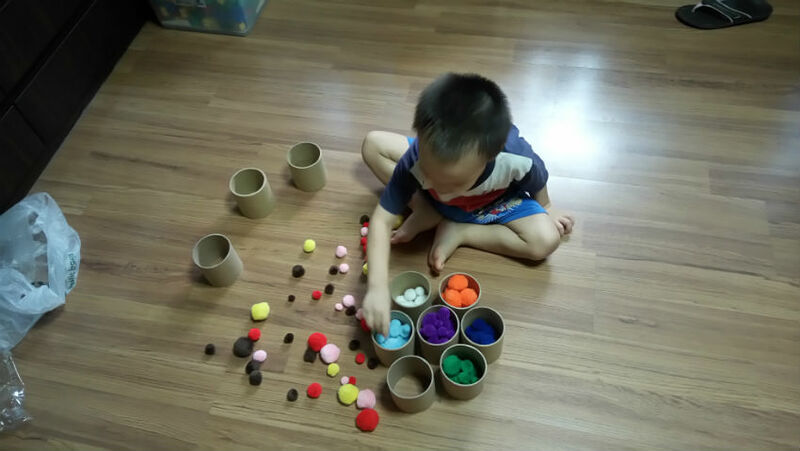 Giving meaning to loose parts requires parents to think about the possibilities of how a child learns and also consider the materials and environments that the child uses. A carefully put together collection of loose parts designed to allow for open-ended play and exploration is also known as an "invitation to play". 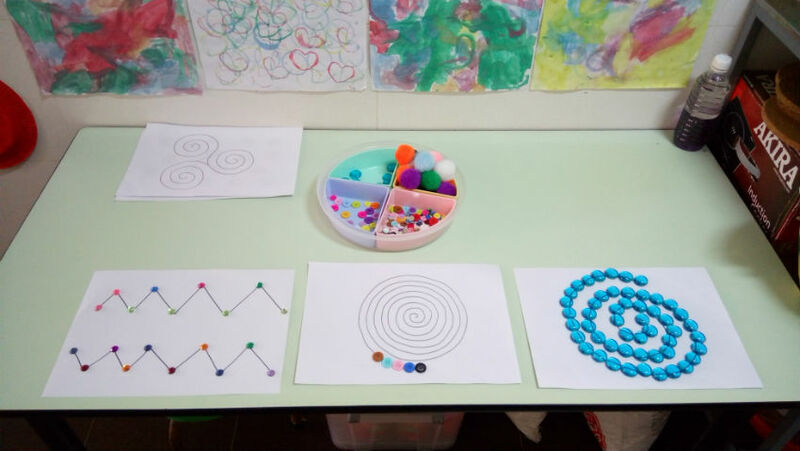 This term is deeply rooted in the Reggio philosophy that believes children are able to direct their own play when they are offered open-ended and meaningful resources to explore. He built three shorter towers this time, then proceeded to drop pom-poms randomly into each one. 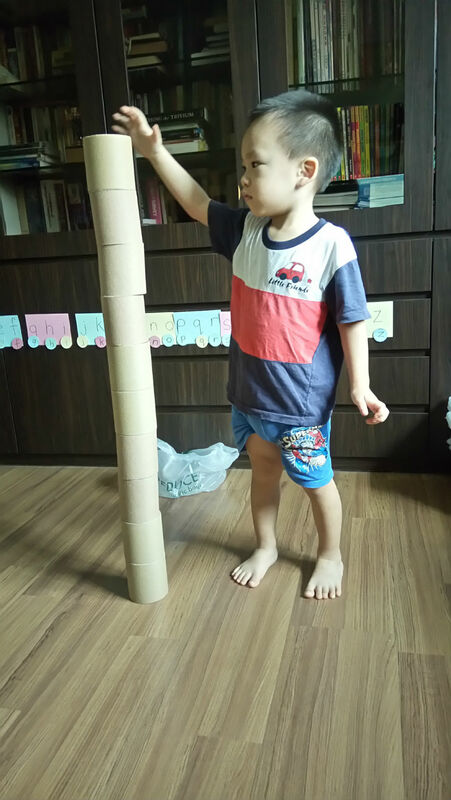 He stopped when one tower was filled to the brim. 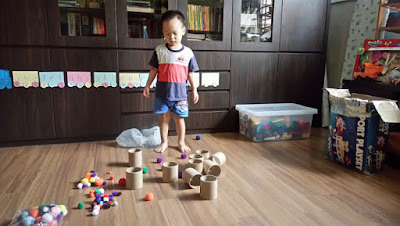 After that he started to do colour sorting with the pom-poms and cardboard tubes. Just a simple invitation to play, but so many possibilities! David was fully engaged for about 40 minutes. It was very satisfying to witness such spontaneous play in this extremely simple set-up. A closer look at the loose parts. Loose parts can be so beautiful, don't you agree? 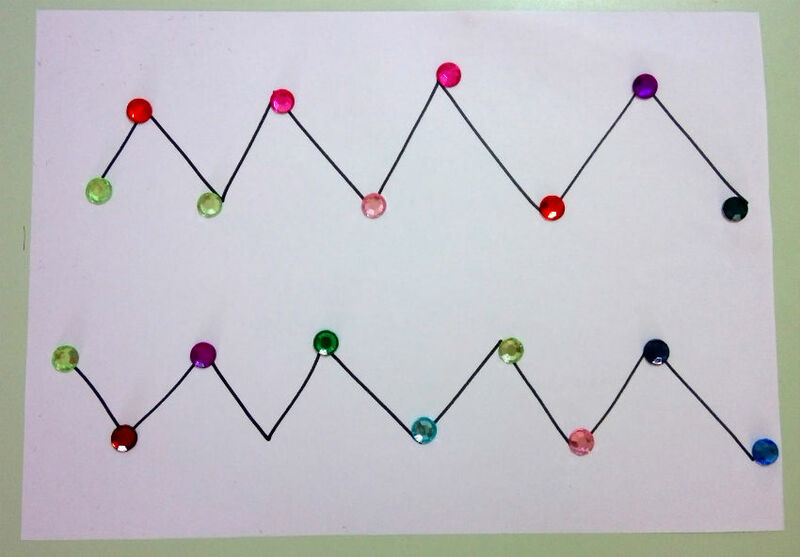 David started by placing coloured gems on the zig-zag pattern like this. 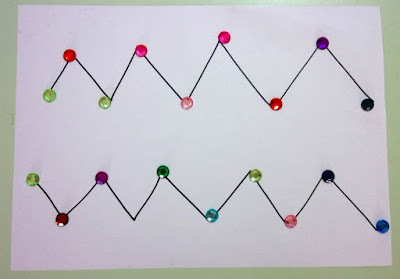 I had expected him to just put the gems on the lines and trace them, but obviously he had a mind of his own. I was reminded that we are all different and can have different ways of doing things. After finishing his 'work' on the zig-zag pattern he started working on the spiral one. 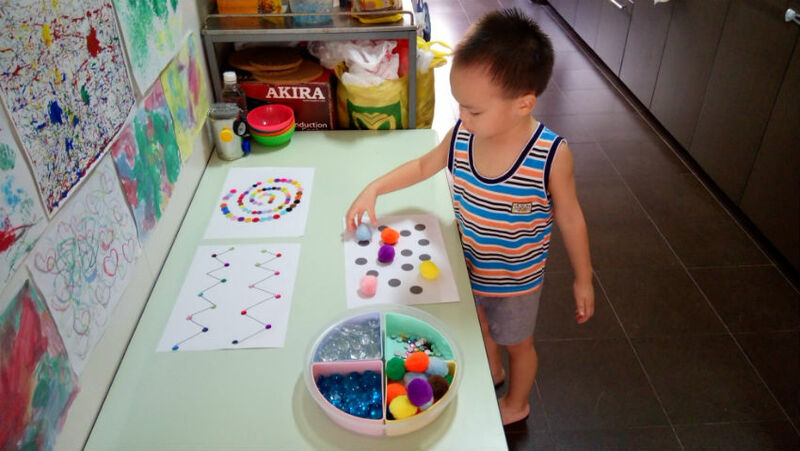 This time he chose to place coloured buttons on the line. He was quite particular about the size of the buttons he chose (I have big and small buttons in the tray.) He wanted the big buttons on the outer curves and when they were all used up he filled the inner curves with the small buttons. This was how it looked at the end. I simply love the colours! David then proceeded to work on the paper with big, black dots. 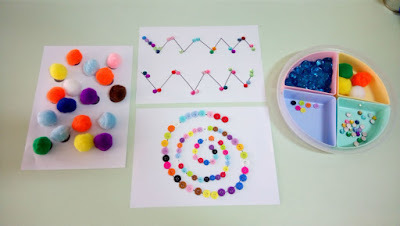 He put big, colourful pom-poms on the dots to cover them. The above picture shows how the invitation to play turned out at the end. I really love the results. They are so pretty! I left the invitation out on the table after he finished. A few hours later he wanted to play again. This time he used the blue glass gems to trace the spiral pattern. 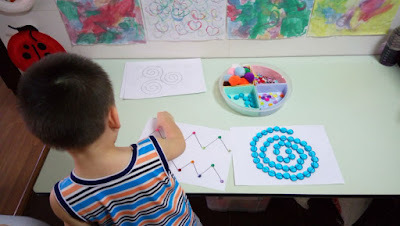 He started working on another spiral pattern but left it unfinished, which was alright with me as I knew he had worked hard concentrating on working these patterns for the day. This invitation to play provides the opportunity for children to train themselves in patience and concentration. 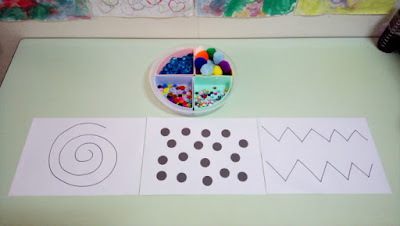 It is also a great activity for improving fine motor and hand-eye coordination skills! 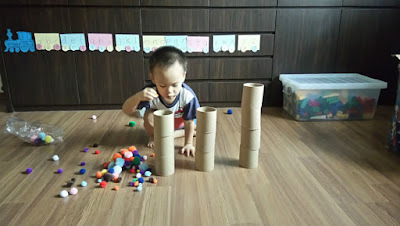 I have just given two examples of loose parts play in the home. As you can see, they are not difficult to implement in the home at all. What is needful though, is that the parent must have an open mind. Try not to 'force' your own ideas onto the child or interfere with his or her tinkering. If your child is really stuck you may try working on your own project with the same materials unassumingly. Let your child see you creating and tinkering, and he or she will soon want to imitate you! Don't feel discouraged if your child does not show interest in the invitation that you set up. Children, like adults, have their preferences too. Many times the same invitations that were unattractive initially became interesting to them weeks or months later. Try offering the same invitations at a later time or do some variations to suit your child's preference. Loose parts play in the home need not be complicated, yet it offers so many possibilities for the child to play and explore. I strongly encourage parents to try to incorporate this type of play in the home. I'm loving the results, and I'm quite sure you would too! Awesome job. Thanks for sharing your ideas. By the way, love your apartment. HAA.... My apartment is super small, sometimes is hard to manage fun projects with my kids. Thanks for your encouragement! I try my best to keep the house clutter-free so I'll be more motivated to do activities with my child. Yes, I can understand the constraints when space is limited.